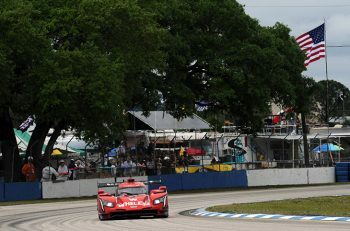 DSC spent plenty of time last week hearing from drivers about how incredibly tough Sebring International Raceway is on cars, set-up, tyres and… well, themselves. So we thought we should find out first hand. Braving these conditions is a leap of faith but, for you dear DSC reader, someone just has to do it. After less time considering this than separates a GTE-Pro grid we headed toward Turn 17 where our chauffeur awaited us for a couple of quick laps. A.J. Alsup is a former NASCAR driver here in the U.S. with a family racing pedigree. His father Bill Alsup ran for Penske in Indycars in the early 1980s and was a contender. These days A.J. 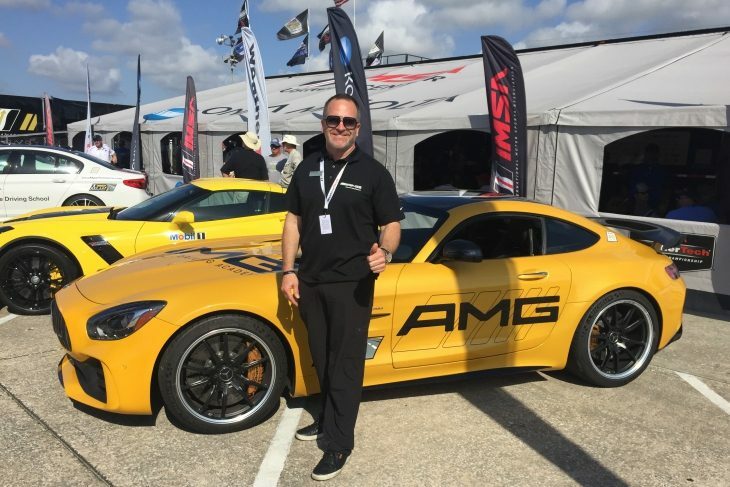 is Chief Driving Instructor for the AMG Driving Academy, Mercedes AMG’s high-performance driving school that is represented all around the world. The main challenge around the Sebring International Raceway is the many surface changes and its bumps, but the Mercedes-AMG GT R is an extreme piece of road car technology and is our weapon of choice. Its 4.0L V8 Biturbo powerplant delivers 577hp and 516 lb-ft torque through a 7-speed transmission with, crucially, adaptive suspension and rear axle steering. 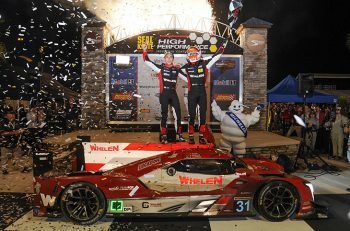 According to A.J., the car has been set up as a high-performance race car but the suspension softened to perfectly match the Sebring conditions. From our standing start on the inside of Turn 17, the acceleration and traction are astonishing as we thump the first treacherous pair of bumps on the apex and the exit of the circuit’s final turn. Spectating here you see and hear the less well-sorted cars jolting before accelerating down the main straight. Our speed is shy of theirs of course (though not by that much…), but AJ is as on it as he is allowed to be and the car bucks hard through the section despite its set-up. A guest demonstrator lap this may be but as he says, “Put a car ahead of me on the track and I’m a racer, I can’t help it…!” The Porsche driver ahead of us is clearly having some fun too. Braking under the famous bridge, a wide entry into Turn 1 swings us left to the inside apex on a classic racing line and allows a very close look at the concrete wall. No lifting, the car tracks out naturally over more bumps to the right-hand edge where a dab of brakes balances the car for a late turn in at the narrowing Turn 3, the renamed Kristensen Corner. The switch from the open raceway to the tighter infield is almost intimidating as a wall of race fans faces you and the bumps kick in again. There’s no need for aggression here and we thread through, right up with the Porsche now, whose brake lights seem to be on a little more than ours; we back off momentarily. Opening the steering and winding left through Turns 4 and 5, up through the gears and hugging the right-hand edge, we’re into what seems like a tunnel of RVs and spectators, Green Park an intense blur on driver’s right. It looks like it ought to be smoother, but no way, more bumps and jolts. Down toward what AJ says is a critical part of the lap, the tricky Turn 7 Hairpin: “One of the challenges of Sebring is finding grip and balancing that with the surface changes.” We leave the braking on the concrete late until the 200-metre board and are hard enough on the brakes to place the car deep for the sharp right turn in. Straight-lining the flick left-right on the exit we’re back on the power early, very bumpy here before the circuit opens up onto ‘better’ asphalt flowing through the Fangio sweepers. Turn 10 is a hard braking and hard drinking zone in equal proportion depending on your perspective, its infield viewing structures in our peripheral vision. The right-hander is slightly off camber too and there is a lot of rubber down here on the exit that points towards a swift excursion to the grass. But not for us… the Mercedes transfers its weight forward perfectly as we scrub off just enough straight-line speed, hitting the right-hand apex to get the best flow through the tree-lined left-hander, Collier Curve. There’s asphalt here, but like most of it at Sebring it has seen better days and is no guarantee of better grip whatsoever, it’s just another style of undulation and where it has repaired the concrete slab track is often where it does its worst. A.J. balances the car on the throttle and picks our line for the 90 degree right that is the old Tower Turn; more bumps as we make the transition back to airfield slabs, adding to the thick coating of rubber on the kerbs as we take our apex, a small field of marbles and debris on the exit. Our vision is more open now as we quickly build speed and set about reeling in the Porsche ahead. The straight is far from smooth but great lateral grip from our Michelins takes us through the fast left-hander of Turn 14, Bishop Bend, the tighter right at Turn 15, the Gendebien Bend, soon upon us suggesting we’d got the section pretty well hooked up. An awesome circuit and like absolutely nothing else. Our sincere thanks to A.J. and the AMG Driving Academy for a unique experience.